As writers we need several things to keep us going, and inspiration, information and organisational skills are among the most important. In fact, a PA wouldn’t go amiss either. 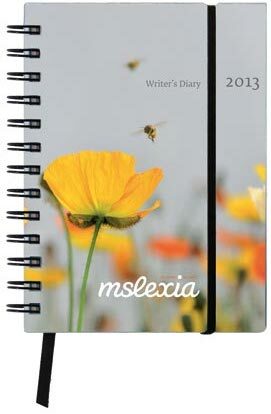 The Mslexia Writers’ Diary 2013 provides far more of this than you might imagine. From the beguiling front cover artwork to the valuable ‘resources for writers’ section towards to rear of the book, it provides everything you need to help you keep every deadline in check and make use of each writerly opportunity going. As well as plenty of space to scribble down your commitments, thoughts and ideas, the diary also contains some unique sections specifically for writers, including tips on networking, advice on manuscript layouts, a glossary of editing marks, (and, randomly yet pleasingly, cooking conversions), features focusing on the creative benefits of collaborations, plus a submissions diary, and a comprehensive selection of the key literary events and competitions you can make use of in the year ahead. Throughout the date pages you’ll find suggestions, recommendations and musings on writing from inspirational authors such as Alice Walker, Kiran Desai and Meg Rosoff. If you carry it with you you’ll always have something interesting to read! I love the fact each page presents a new treat, and masses of space to scribble down bursts of inspiration, as well as having the traditional slots for each day’s events. It’s a great way to motivate yourself day by day, keep you flitting from flower to flower, and make this your best writing year yet! This entry was posted in Writing tools and tagged Mslexia Writer's Diary by Judy. Bookmark the permalink.